Plato and Hazel Blears do not often make it into the same sentence but they do share a common concern: from ancient Greece to the Salford Chipmunk, the arts have troubled the polis. Admittedly Hazel Blears is not as extreme in her views as Plato, who sought to banish poets from his Republic for fear of their deleterious effect on the citizenry. Nonetheless Blears, speaking last year when still a Minister, expressed her worries about the corrosive effect of fictional accounts of politics and politicians on this country. Wondering why people might be deterred from participation in politics, she ruminated that one factor might be its portrayal on our TV screens. While Americans enjoy a tradition of uplifting political narratives from Mr Smith Goes to Washington to The West Wing, by contrast the British, she argued, are served with a diet of either the incompetent (Yes, Minister) or Machiavellian (House of Cards); two tendencies synthesized today in The Thick of It where clueless ministers are the playthings of conniving spin doctor Malcolm Tucker. This Atlantic divide between American reverence and British cynicism is a commonly recognised one, although in truth both nations’ traditions of political fiction are more nuanced than this division suggests. However, the questions Blears raises are interesting and have been seized upon by a number other commentators. There clearly is a difference between the ethos emanating from the Bartlett White House and the sweary, headless chickens that inhabit DoSAC in The Thick of It. So does scabrous British political fiction pose a danger to democracy, as Blears and others have suggested? In part the answer may be yes – and that’s the way we Brits like it. Our politicians are just that and nothing more: representatives to whom we lend our vote but not our total credulity (perhaps our relationship is made more simple because the Head of Government and the Head of state are not one and the same, as in the U.S.) If our depictions of them seem unduly negative, this comes from a positive place; the desire to deflate our rulers. Although ironically we can make a hero of House of Cards’s diabolical Chief Whip Frances Urquhart which might perhaps be read in terms of the British voter (think of the reaction of both Right and Left to Thatcher) yearning for a politician who ‘knows what s/he wants’. If U.S. fiction consistently portrays the politician (more often the President actually) as hero, it is understandable why the British politician should look on in envy. But does the aura of liberal self-satisfaction that surrounds The West Wing really offer a preferable alternative? Rather than dull our sensibilities, Britain’s more skeptical take on its corridors of power might prompt us to question the practice and purpose of politics in this country. Take The Thick of It’s Malcolm Tucker: fast becoming a national hero for his ingenious cussing (when will the BBC wise up and start selling those tea towels with Tucker’s Law embroidered on it?) but also held up as the sign of all that is rotten with our current system of government where politicians are in thrall to the spin doctor and, in any case, spin is all there is to politics. But is it that clear cut? Look beyond the façade of pyrotechnic profanity and alarmingly bulging temples, and just how effective and in control is Tucker? If there is any power behind the throne in The Thick of It, ultimately it belongs to the media and its agenda. Whether this should be the case or whether the energy expended upon spin by Tucker and his colleagues is a worthwhile justification of their time or existence lies at the core of the drama. Witness what seems Tucker’s increasing steps towards a breakdown in the current series. And what about the politicians themselves? 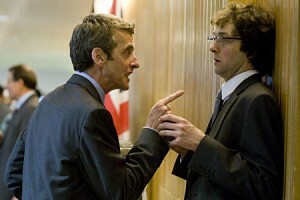 Our real-life elected representatives have struggled in recent months to give a good account of themselves in light of recent events but I would venture that fictional accounts such as The Thick of It might be able to elicit a little understanding – even some sympathy, for the politician’s lot. In one memorable exchange during the first series, beleagured minister Hugh Abbott muses on how a trip to the toilet offers his only chance for ‘a bit of quality time’. Hugh: I know both of those things already. Margaret Thatcher used to survive on less that 4 hours sleep a night. How is that possible? Glen: Well Hugh do yourself a favour, stay at the flat. Glen: I mean do you actually get to see the children? Hugh: Glen, I don’t have time for that. All I do…I eat, I work, I shower – that’s it…occasionally I take a dump…just as a sort of treat. Really, it really is my treat; that’s what it has come to. Yeah, I sit there and I think, no I am not going to read the New Statesman, this time is just for me. This is quality time…just for me. Is that normal? Hugh: At least I’ve made something. Holding public office is not an all-expenses-paid picnic in The Thick of It but a matter of endless drudgery, unbearable pressure and relentless scrutiny. It’s hard not to feel sorry for someone whose loo break is the highlight of their day. So whilst we Brits might not emulate the optimism of The West Wing in our fictional accounts of politics this may be because we would rather examine than be immobilised by self satisfaction. Perversely, then for all its cynicism The Thick of It may have been able to do some work in directing our sympathies (or at least understanding) towards our politicians. If that work has been made harder it might be that politicians like Blears need to look closer to (their second) home rather than picking on Malcolm Tucker. Originally posted: 10 February 2010.